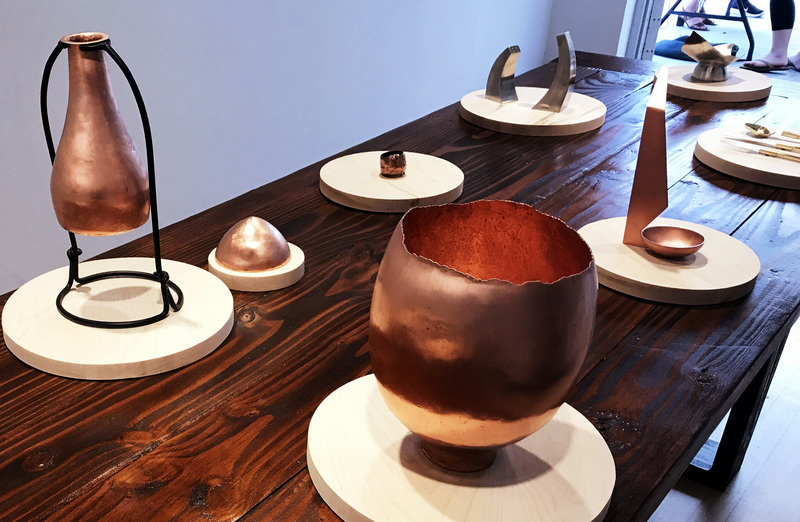 My student Eliza Karpel writing about Krystal Ramirez’ BFA Metals thesis exhibition La Cena esta Servida, in the School of Art’s Merlino Gallery on 26 April 2017. Krystal Ramirez is in her last semester at The School of Art at CSULB. She has always been interested in art and attended an art high school. Originally Krystal was focused on drawing and painting, but fell in love with metal crafting after taking a jewelry class towards the end of high school. Ramirez’ exhibit featured both kitchenware and jewelry handcrafted out of various metals. These included copper, brass, sterling silver, steel, and pewter. The overall design was focused on simplicity and minimalism. Each piece of work was laid on a wooden plate around a long, rectangular dinner table that was also handcrafted. Ramirez’ metalwork was inspired by the nostalgia and strong connection of the dinner table in her family home. She was intrigued by the craft of meal preparation and how one could take raw materials and transform them into a beautiful creation. Throughout her life the dinner table served as a place of community, family, decisions, and truths. With this she explores the relationships that are ultimately formed around the dinner table: a central point in her home. I was drawn to the simplicity of Ramirez’ work and found it absolutely beautiful. Many of the pieces she created were sculpted in a way that was different than we might see them in our home. It gave a new, aesthetic twist on familiar objects. For example, she created a spoon that was shaped somewhat like an octagon. I loved her work so much and I actually would love to have creations like hers in my own home. One piece she made was a copper drinking vase but I thought it would be absolutely beautiful with flowers in it. Krystal talked about possibly making some of her pieces more consumer safe so she could use them in her own home and kitchen. If she does, I would totally buy some of her art! Krystal Ramirez’ BFA Metals thesis exhibition, La Cena esta Servida. Photo by Eliza Karpel.